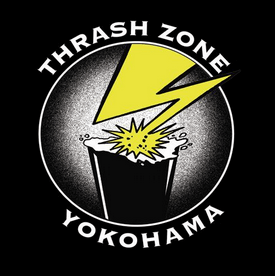 Thrashzone Brew Labo is the official brewery of the bar with the same name, Thrash Zone. When the bar first started, Katsuki-san was brewing at Atsugi Beer in Kanagawa, with the Thrashzone Brew Labo Hop Slave being the first beer brewed under contract. It is still brewed to this day. In 2011, Thrashzone Brew Labo obtained a license to start brewing on what they call a nano-scale, producing 120L barrels of beer per batch, just enough for six kegs. As a result, the beers aren’t easy to find outside of Yokohama, but they can be found if you look hard enough. And they are worth looking for. All of their beers follow the same philosophy of “extreme beers only”, in one way or another. These beers here are considered to be the main ones available throughout the year at Thrash Zone. Thrashzone Brew Labo Hopslave – A 9% imperial IPA that was the first beer brewed by Katsuki-san at Atsugi Beer. Powerfully hoppy and pungent due to the large amount of Amarillo involved, the hops will make you their slave. Thrashzone Brew Labo Hop Deicide – An 8.9% imperial IPA brewed using Simcoe hops that produce a bitter beer. Thrashzone Brew Labo Speed Kills IPA – A 7.8% IPA brewed using the Chinook range of hops. Perhaps the best beer to start on at Thrash Zone if you’re looking to ease yourself in. Thrashzone Brew Labo Morbid Red – A “mild” 6.8% amber IPA brewed using El Dorado hops. The colour was designed to look like the Keikyu trains that pass nearby through Yokohama station. Thrashzone Brew Labo Tsuruyacho Ale – A 5% golden ale that is an homage to the surrounding district that Thrash Zone is located in. Thrashzone Brew Labo Front Side Grind – A collaboration with Felem Skates shop that produced a 3.5% session IPA, great for knocking back and not getting too drunk to skateboard. Thrashzone Brew Labo Envenom – What’s more extreme than a 11.8% barley wine out of season in summer? Thrashzone Brew Labo Towers of Power – An autumn seasonal with a slightly higher than usual abv of 10% for Thrash Zone.